Aluminum is a good sustainable choice for a building retrofit. The design and color of a balcony system can complement the look of a historic building. 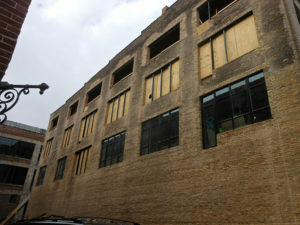 In this instance, the powder coated black aluminum picket railing blends in with the look of the warehouse windows. The smooth underside of the aluminum decking is the color of the cream city brick. Together this prefabricated aluminum balcony system serves to hold onto the building’s integrity, and maximizes the quality of life for its new residents. Aluminum is a sustainable metal. The lightweight, strong, and infinitely recyclable nature of aluminum makes it a wise choice for carbon footprint reduction. No other metal can match aluminum’s sustainability advantage. Balconies can take advantage of its strength, durability, impermeability, and natural corrosion resistance. Unlike other balcony construction methods, the entire aluminum balcony can be recycled. 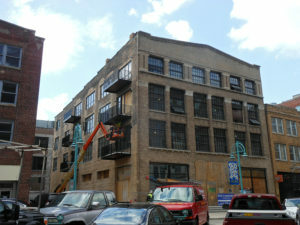 The economic and environmental value of building reuse can offer savings over demolition and new construction. One key is to minimize the input of new construction materials. The use of balcony support brackets provide a non-invasive minimal way to give an old building new purpose. 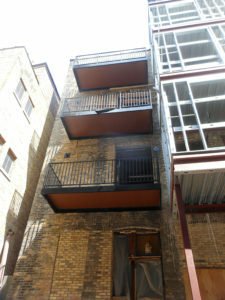 This bolt-on balcony system helps modernize the building without the use of destructive cantilever balcony construction. Additionally, the avoidance of cantilever construction allows for the preservation of the infrastructure. 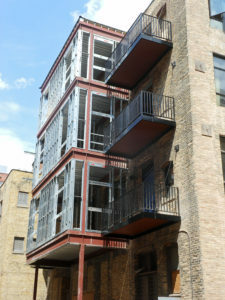 A self-supporting balcony preserves the content of the structure by bolting to the outside of the building. This prevents the disruption of the inherent structure, as disruption may create unforeseen challenges. A hybrid of restoration and renovation for a building retrofit serves to modernize buildings for today’s quality of life expectations. Historic structures were often built for long term use against the elements, though every building deteriorates without care. The use of modern materials such as aluminum can boost property value, long term use, and continued purpose. Residents can reflect upon history, and connect with the revitalization of their community by stepping out of yesterday’s warehouse window onto today’s balcony view of the neighborhood.